Everyone knows that Alfred Hitchcock's Psycho is an all-time classic - and everyone is right. It unknowingly, I think, created a new horror genre, the slasher movie. 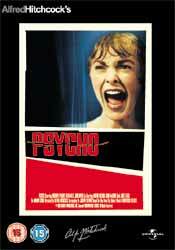 But strictly speaking Psycho is not so much a horror as a thriller. It breaks all the moulds of standard convention. The most unheard of move at that time was to kill-off the star in the first half of the film. Movie-goers were quite naturally horrified. However, anyone who had taken the time to read the novel by Robert Bloch, upon which the film was based, would have known what was coming. Psycho is dripping in style from start to finish, and has thankfully failed to age, except in terms of fashion and attitudes. There is a direct link between this timeless classic and another granddaddy of the genre, John Carpenter's Halloween (which is also more about style than blood and violence). That connection is Janet Leigh (star of Psycho) and her daughter Jamie Lee Curtis (who debuted in the latter film). Anthony Perkins is extremely powerful in his role as Norman Bates. This is a film which hinges on more than a tight script and intelligent direction; without the unbalanced intensity of Perkins' characterisation and acting prowess this could so easily have been reduced to derisible B-movie status. There was a stilted attempt to resurrect Psycho as a franchise series of films on the back of the 1980s slasher explosion, but none of them shared the edginess of the original. What can I say but, everyone needs this DVD in their collection, particularly followers of suspense thrillers and classic horror.